For most of the country’s existence, Egypt has been an Arabic country following the North African Arabic development of swords. However, previous to the Arabic influence, the kingdom of Ancient Egypt was distinct and almost unique in the world. 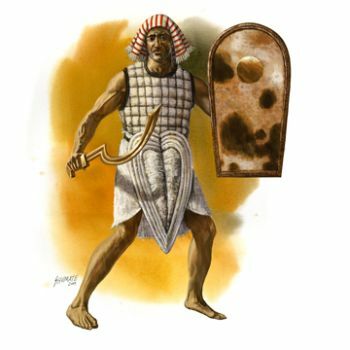 There was never a great need in Ancient Egypt for a standing army of soldiers. The kingdom was very introverted and insular, even shunning trade with foreign powers and certainly forgoing military conquest. As a result, the weaponry of this time period (3150 BC to 30 BC) is somewhat limited. Egyptian charioteers made excellent use of the bow and arrow, but for infantry the weapon of choice was the bronze Khopesh. The Khopesh was typically around 50 to 60 cm long and had a crook-like curve or hook, used to disarm opponents quickly and easily. The inside curve of the hook was not sharpened, but the outside curve was the single cutting edge. Many Khopeshes were manufactured with no intention of ever being sharpened, usually as offerings in high profile graves. The designs of these weapons were quite intricate. Though the main blade was made of bronze decorative inlays of electrum were quite common. Later examples were also made in iron. Swords were not too common in ancient Egypt. Egyptians used very often daggers or a short swords of various shapes as a tool. However, the major exception to this rule were the Egyptian swords known as the Khopesh – the cruelly curved sickle sword adopted from the Canaanites, which was used to execute en-masse their enemies, as an infantry weapon and also as a symbol of the authority of their nobles. This entry was posted in Swords and tagged Egyptian swords, Khopesh, Sicle sword. Bookmark the permalink.